The graphic above appeared in the FT magazine and provides a very interesting insight into where some of the main wine importing nations get their wine from. 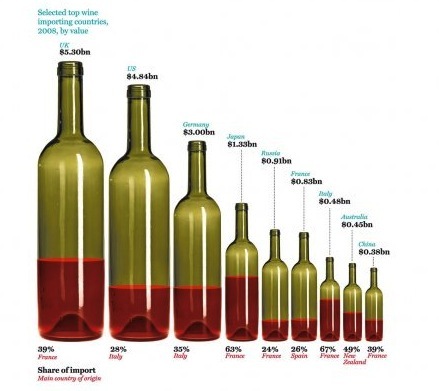 The size of the bottle indicates value of wine imported and the amount of wine in the bottle indicates the main supplier of that wine and their percentage contribution to the imports. Came across this graph on the always excellent JancisRobinson.com.